Shown above is a beautiful new Deco bed headboard, inspired by a famous cabinet by Jean Dunand from 1921. Dunand produced some of the most striking high quality Deco work in France. The original was a joint venture between Dunand & Jean Goulden, & features an abstract landscape design around the carcase. 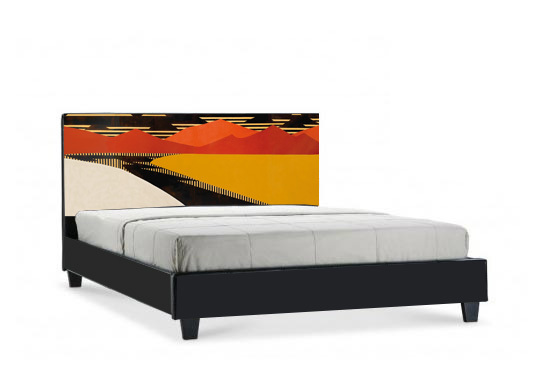 Even though polychrome painted the headboard looks very crisp & graphic. This would make a stunning focus piece in your bedroom. Then add some matching bedside tables & wardrobes to complete a stunning bedroom. Keping to the original proportions we produce this headboard in several sizes. The bed is shown purely as a display vehicle for the headboard, but we could produce the whole bed if you like. Made to order. This design has been registered now, & may not be reproduced without our written consent. All rights reserved.